I should like to see an unelected upper chamber continue. Not necessarily… well… definitely not with hereditary positions or Church of England bishops, and possibly not life-long. The principle, however, of people who have – in theory, at least – done something with their lives acting in an oversight capacity appeals to me. No more so when I consider the career trajectories of many MPs and, increasingly, MSPs. Having gone from university political unions, they then get an internship (assuming mum and dad can bankroll them) or are employed in some MP’s office. From there it is onto PPC (preferably in a safe seat), and then Spad status and work their way up the greasy pole of party machinations to get a weighty cabinet position. If they are unlucky enough to be voted out and, in the case of MPs, have upset the system so much that they cannot be elevated to the Other Place, they will take advantage of a generous severence/relocation fee and hope for consultancies or well-paid sinecures in quangos or NGOs. Like a neo-aristrocracy, they have become so separated from the wider public, that I only can hope that they are being scrutinized by a group of individuals with actual life-experience and who are not another bunch of hacks on the make. Although the House of Lords was established and had its powers strengthed at a time when this country did not follow a social democractic model, it was established to keep in check any selfish and personal interests of the House of Commons. Part of the currency pushed by the SNP was that they were an antitode to old politics, and could be seen as men (sic) of the people. Then Alex Salmond’s oleaginousness became more and more turgid as what once was seen as the cheeky resourcefulness of the underdog became more and more like recklessness and making-it-up-as-he-went-along. Candidates in the 2011 Holyrood elections who had not expected to get in, came through during the landslide; and soon the senior leadership were dealing with publicity disasters like Bill Walker or plain embarassing behaviour like that of David Torrance. At the admittedly milder of this scale was successful candidate for Caithness Landward, Alex Macleod. After winning an internship with Alex Salmond’s office, he went on to work on the Rob Gibson’s 2011 Holyrood campaign in which Gibson secured the Warren’s constituency seat. To continue his rapid rise, he attempted to secure a local council candidacy in the Tain area where he is from, but when this failed was placed as candidate for Caithness Landward; which he won in May 2012, albeit on the seventh round of counting for STV. From there he sallied forth into several weighty council and ex officio positions, and started touting himself for PPC Holyrood candidate with Gibson’s backing. During the council campaign, complaints were raised against Gibson’s constituency office for swinging the lead regarding expenses claims which, on analysis, were seen to be promoting Macleod and sitting Wick candidate, Gail Ross. The day after the local elections, the Scottish Parliamentary Corporate Body decided Gibson had indeed breached the rules: although no real censure appears to have been applied, Gibson objected to reporting of this ruling against himself. Shortly afterwards, a separate complaint was raised with the Police by an unnamed individual against a councilor assumed to be Macleod. His allocated campaign expenses had been £1226.04; and the stated reason included the non-filing of a hotel bill, with total allocated expenses coming to £88.43 below maximum. It was stated at the time that almost £1,000 had been spent on newspaper ads and promotional leaflets, leaving little for other matters. It is now being reported that Police have passed Macleod’s details to the Proculator Fiscal according to the Representation of the People Act (1983), something which did not happen following similar allegations against Conservative MP for Richmond Park, Zac Goldsmith. Macleod has resigned forthwith from the SNP group, but not his seat. I am unsure of other completed investigations into electoral overspend (although a similar complaint has been raised against Perthshire Independent councilor, Alan Ward), but surmise that at the worst end, Macleod could be banned from public office for a finite period and a byelection necessitated. A $5 billions uniform redesign by the US Army was intended to introduce a pixellated grey and black universal uniform which was even cooler than the newly introduced USMC uniform. Maybe a 1970s episode of Doctor Who, then. Rather like the British Army after the First Boer War. On the Scottish East Coast, this would have been haar. As with every time a heavy sea fog rolls in from the Arabian Persian Gulf into Dubai City, so come the photographs of those buildings higher than 500 metres sticking above the cloud. 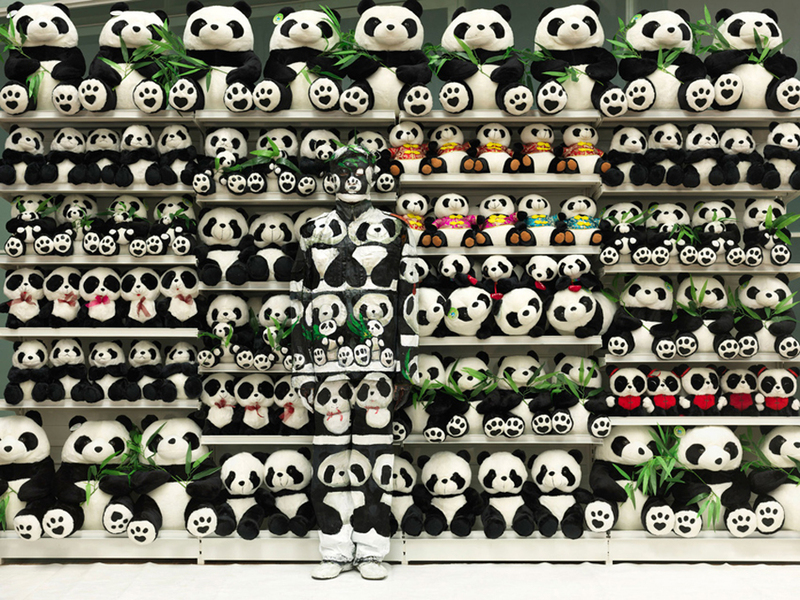 © Liu Bolin, Courtesy of Galerie Paris-Beijing (from PDN Photo of the Day by way of Mick Hartley). Liu Bolin’s solo exhibition, Hiding in the City, will open on January 10th in the gallery‘s Paris space and remain on view until March 9, 2013. You are currently browsing the A Rabbit's Eye View of the Hyperborean North blog archives for December, 2012.